When the researchers visited this mountainous part of New Guinea, they found new species of various kinds. They also discovered that the unusual tree kangaroos even existed here even though they were not common despite the undisturbed nature. In New Guinea, there are 10 species of tree-climbing kangaroos and northern Australia there are a few more. All of these are in low numbers. In New Guinea there are about 10 000 of them. Their main enemy is humans who hunt and eat them. Other enemies are pythons in northern Australia and an eagle in New Guinea, but this eagle is mostly eating the possums. Otherwise, predation does not seem to play a major role in this part of the world. This applies especially to the beautiful paradise birds. An unusual situation. The tree-climbing kangaroos are not as agile as monkeys but they are durable. They can jump to the ground from the trees at 30 meters height without injury. Sometimes they jump down when they get scared. 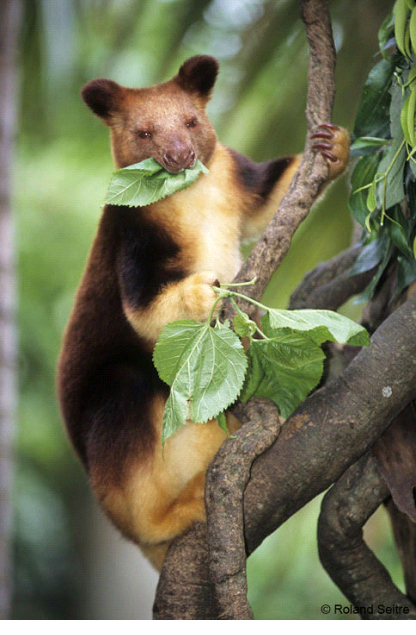 The picture shows one of the tree-climbing kangaroos from New Guinea.